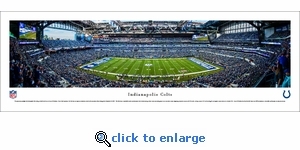 This panorama spotlights the Indianapolis Colts taking on the Detroit Lions at Lucas Oil Stadium. 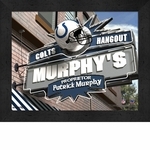 Due to their loyal fans, the Colts have an impressive attendance streak with consecutive sellouts dating back to September 21, 2003. 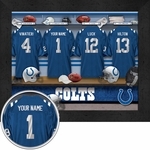 The Colts have a remarkable number of achievements that include winning at least seven consecutive games in six consecutive seasons, beginning consecutive seasons with 9-0 records, starting a season 14-0 and recording the most regular season victories in a decade (115). Lucas Oil Stadium has been the club’s home since 2008 and features a retractable roof that opens in only nine minutes. Outside dimensions are 13.75 x 40.25 inches. The panoramic frame measures 7/8 inches out from the wall and is 3/8 inches wide with a rounded profile. Mounted and backed with foam core to prevent warping. Covered with tempered glass. Ready to hang. Outside dimensions are 15.5 x 42 inches. The panoramic frame measures 7/8 inches out from the wall and is 1 1/4 inches wide with a square profile. A single mat in team or event colors. Mounted and backed with foam core to prevent warping. Covered with tempered glass. Ready to hang. Outside dimensions are 18 x 44 inches. The panoramic frame measures 7/8 inches out from the wall and is 1 1/4 inches wide with a custom sculpted profile. Double matted in team or event colors. Mounted and backed with foam core to prevent warping. Covered with tempered glass. Ready to hang.